such models into our test lab. Led printer Ricoh SP C360DNw designed for full color documents of A4 and its derivatives. It belongs to the category of office devices, but it can be applied to ordinary home user. a brief printed installation guide and other printed materials. The delivery is traditional and requires no comment. 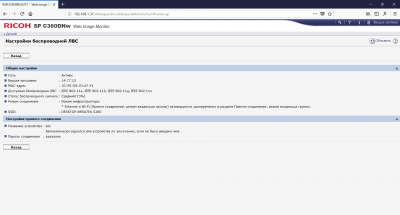 * Average price in “Yandex.Market” at the time of this writing. Works printer running SoC solutions Marvell 88PA6270 based on Quad-core 64-bit processor ARM Cortex-A53. The CPU is running quite high for a printer clock frequency of 1,2 MHz. RAM on Board the device only 512 MB. Model name Ricoh SP C360DNw encrypted have this printer, not only a wired Gigabit Ethernet, but also embedded wireless communication module Wi-Fi. Also the printer interface is equipped with NFC for quick connection of mobile devices and a USB port for printing from external media. A regular complete Ricoh SP C360DNw designed to load up to 250 sheets of A4 and 80g/m2, is laid in the main tray, and 100 sheets put in the bypass tray. If you want you can buy another tray of 250 or 500 sheets, thereby increasing the maximum amount of pledged paper. Optional tray may be useful in the case when you want to simultaneously have the printer paper. It should be noted that the printer works with paper weights up to 220 g/m2. This allows you to print on this device different colored brochures, book cover or booklet. The manufacturer claims a rather high level peak monthly load: 75 000 sheets. This is enough even for many large offices, not to mention the small and medium. The resources supplied for this model of printer toner cartridges can be described as standard. The black cartridge may have capacity for 2 500 or 7 000 pages, and color – 1500 or 5000 pages. Along with the traditionally delivered printer cartridges are the smallest capacity. Resource photoconductors is not the highest. Black has 15,000 pages and color by only 12 000. It should also be borne in mind that after about 13 000 prints will have to replace the waste toner bottle, and using 100 000 and 150 000 prints to attend to the condition of the intermediate transfer unit and, accordingly, the block fuses. Out of all these consumable components and keeps the cost of one imprint. The printer has very impressive of its type (printing on A4) dimensions and weight. Best of all, this device will look on a separate pedestal. In the design of the hull is beige plastic and imparts solidity and rigor dark grey. This model will easily fit in any modern interior. It is worth noting the presence of numerous vent holes on the body of the Ricoh SP C360DNw, so to move it close to a wall will not work. The layout of the external elements of the housing classical. The upper part is occupied by the receiving tray capacity is 200 sheets in A4 format. The tray features a pull-out plastic stopper to prevent the paper when printing. The main feed tray is placed in the lower part of the body. It can be fully removed for adjustment and cleaning guides. The inner part of the tray made of a combination of plastic and metal elements. The tray has a sliding mechanism that allows you to place sheets of paper in length up to 356 mm. While the back of the tray will extend beyond the edge of the printer’s at the bottom of the housing has a hinged tonneau. It is worth noting that the main tray has a convenient handle for putting custom indicator paper size, and mechanical the number of the remaining sheets. The bypass tray located on folding the front panel of the printer. It has the standard design with plastic guide rails and sliding mechanism elongation. This tray holds 100 sheets of A4. Wired interfaces novelties located on one of the side edges of the chassis, under a plastic cover with a cutout. Here is the network port, RJ-45, port USB type B for connecting the MFP directly to a computer. Connector for the power cord is on the back at the bottom of the hull. Also note that the Ricoh SP C360DNw has a power control button, placed on the front panel, next to the main tray. Top dead center, the front edge of the body of the Ricoh SP C360DNw located control panel with a monochrome LCD display. The control unit has an easy adjustable angle. Around the display are the navigation buttons, button direct wireless connection with the mobile device and the reset button job. Well, at the edges of the module are placed the power indicators of the current task and errors, if any in print. Under the display behind a thin curtain hides a USB port for connecting external media. The internal construction Ricoh SP C360DNw has quite a few removable elements forming a set of consumable parts, which we have already mentioned above. Under the drop-down top panel, one after the other located slots for the four toner cartridges. Cartridges are very simple to replace. This operation requires minimal time and minimal knowledge. Opening the front panel, the user gets access to several model components. In the lower left corner is located the waste toner bottle, made of clear thin plastic, which allows you to visually control the free space inside. On the inside of the door fixed part of the transfer unit with the shaft, which also periodically need to be replaced. Drums located inside the housing, under a removable block fuses. The overall internal design of the novelty is a bit unusual, but very carefully thought out. Each model component is readily accessible, so maintenance issues printer should arise. Drivers for printer can be installed from the supplied CD and from the official manufacturer’s website where, by entering the search page corresponding to the model number, you can find the most recent version. The installation package is just a set of drivers without unnecessary applications to operate the device. The user will have to select the connection type: USB or LAN. In the second case, the printer can be connected to both the wired and wireless network. The process itself is nothing remarkable no different and requires no comment. We connected a new wireless router. In this case no overlap occurred. 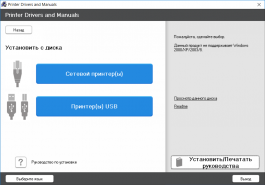 The installation Manager will automatically recognize the printer on the network and installed all the necessary drivers. Fundamentally working with Ricoh SP C360DNw is no different from working with any other printer. All print settings are collected in the menu on three pages. Here you can set the page setup and paper type, select paper feed tray, apply watermarks, set the sort order. Note the presence of individual settings (tray selection) for the cover of the document, if any. In the section of the quality settings the user can set the print resolution: 600 × 600, 1200 × 1200 or 600 × 2400 interpolation. On this page you can set the priority of the print (speed or quality), as well as a deeper color adjustments by setting the profile by configuring the dithering by selecting the type of image transformation. 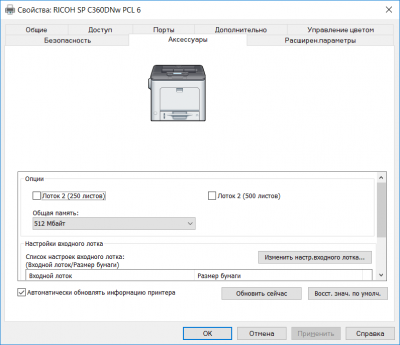 The special panel of the printer settings you can specify the time availability for users to save printed documents, to connect to additional trays. 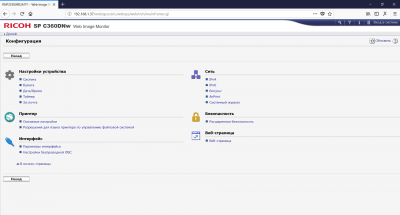 When you connect the printer to the network configure settings and to monitor the status of the device is possible via multilingual web interface. With him we are already familiar with testing other printers the Ricoh, so tell in detail about all the possibilities again makes no sense. 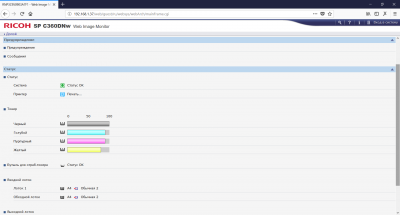 Suffice to mention the fact that via the web interface and you can adjust print settings to set the network parameters and time to track the completion of the resource of certain consumables and replacement components. Print setting as the print can be carried out using mobile devices. You can use the application RICOH Smart Device Connector RICOH or Smart Device Print&Scan, which we have already repeatedly told when meeting with other printing devices Ricoh. Mobile devices can be connected to a local wireless network or directly to the printer. Mobile apps allow you to print documents including various cloud storages such as Dropbox and Google Drive. Well, another way to set up the printer relies on the use of integral controls. Despite the lack of a touch substrate and a modest size display, the manufacturer has tried to make it so that the user does not feel discomfort when communicating with the device. 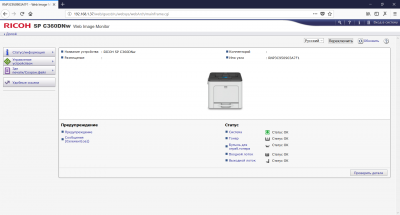 With simple manipulation of the control buttons here you can set the IP address and the password to connect on the network to know the status of the print cartridges, view history print errors or to check the current job. In addition, using the menu, you can configure the print plug-in for the integrated USB port, media. Nothing we hadn’t seen from other printers Ricoh, model Ricoh SP C360DNw we have not seen. However, this printer boasts of having all the necessary for comfortable and quick office work interfaces, and customization options. Well, you can wish it would be only a further development of the features and capabilities of mobile applications. They for some reason the manufacturer has paid not so much attention.